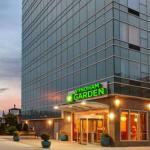 The 24-hour features free Wi-Fi and on-site dining are available minutes from Manhattan at the non-smoking Wyndham Garden Long Island City. The seven-story Wyndham Garden Long Island City furnishes 128 elegant rooms with flat-panel HDTVs mp3 docks free Wi-Fi and premium coffeemakers. International flavors are served for breakfast lunch and dinner in the hotel restaurant. In the city that never sleeps guests have 24-hour access to the business and fitness facilities. For an additional fee guests can park on-site and bring their pets and CitiBike rentals are available right in front of the hotel. The Wyndham Garden is a five-minute walk from the East River in a convenient Long Island City setting less than a half-mile from the Queensboro Bridge. A five-block walk and a 15-minute subway ride leads to Manhattan sites including MoMA. Explore Central Park or head to the top of the Empire State Building each within three miles of the hotel. When looking for the lights and action of Times Square take a 20-minute cab ride west. The hotel is six miles from LaGuardia Airport.